A husband's secrets, a runaway wife, a troubled pregnancy, and an unexpected Storm all these stories included in the next sizzling romantic box set of Finding Love ~ The Outsider Series *Warning this series is filled with rough language and sexual tension that may be offensive to some. 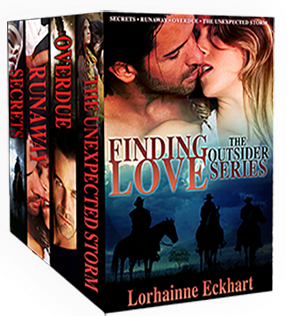 From the #1 Amazon Bestselling Author in Westerns and Western Romance THE FORGOTTEN CHILD, comes the next volume of Finding Love~THE OUTSIDER SERIES with the exclusive short story Overdue. Finding Love~The Outsider Series Volume 2 includes: Secrets: "Jed always told me he'd take care of everything. And I believed him, I trusted him, I loved him." Runaway: Andy sets out to find his runaway bride. And when he finds her he's in for a big surprise. Overdue: (Exclusive to this box set - A Runaway to The Unexpected Storm bridge short story - Diana and Jed are having a baby.) The Unexpected Storm: He can have any woman except the one he wants. Laura’s hair had started to grow out and was now shoulder length, and she kept it tied back in a high ponytail. “Diana, I don’t know how to thank you and Jed for all you've done. This place is better than I could have hoped for. I love that clean smell of new wood.” Laura took in the brand new loft, which had an antique double bed for her and a single bed for Gabriel, with lovely pink and green bedspreads. It was an open design, tastefully done, and even the appliances were brand new. She set her purse on the round kitchen table with four chairs. At the west side of the loft was a cozy living room with a green taupe sofa and chair and a plasma TV mounted to the wall. Laura smiled as she listened to the clomp and clatter of three boys: her five-year-old boy, Gabriel, who leaped up the steps; Danny, who crawled and patted each step; and Jed, who followed, encouraging his son. “He’s a Friessen man; ‘slow’ and ‘easy’ aren't in their vocabulary,” Diana muttered just as Jed stepped closer and lifted Danny, tossing him in the air while he giggled and wiggled. Then Jed leaned down and kissed Diana. Laura went to the window and gazed out at Andy, dressed as he always was in dark jeans and a long-sleeved dark shirt, but he was not as neat as usual. He lifted Gabriel in his strong arms and hugged him. she’d swear they were etched in steel. “How does he know? You and Jed promised me you wouldn't tell him,” Laura pleaded. She didn’t hear him come up, and what made it worse was that he was carrying Gabriel, who, by the looks of it, had no intention of allowing Andy to let him down. She could see how her son worshiped Andy, and that infuriated her. She was standing beside Diana, and it wasn't until Diana stepped back that Andy’s eyes widened and his brows furrowed with something dark and furious. 2012 was an amazing year in the publishing world for me, and it started with The Forgotten Child, which landed on the Amazon bestseller list for western romance and romance series. 2013 has seen me posted in the top 100 authors on Amazon for romantic suspense, mystery/thrillers, and police procedures. Where did it all begin? 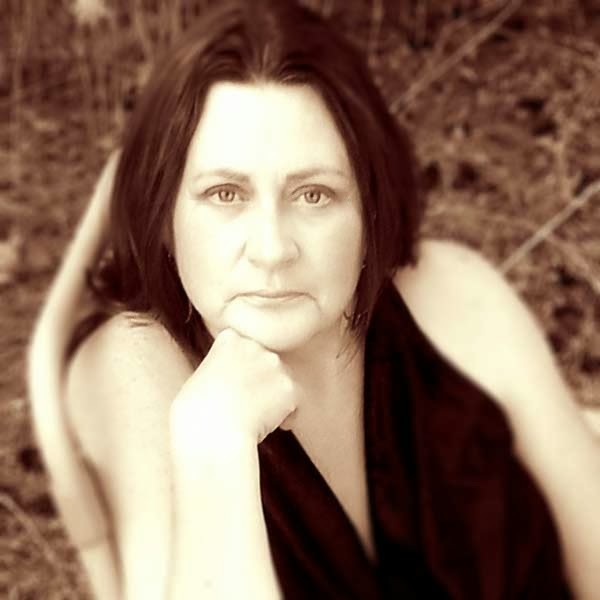 In 2008, I published my first novel, The Captain’s Lady, a contemporary military romance, through The Wild Rose Press. I’ve since received the rights back from my publisher, and I rewrote the book and republished it with a brand new title, Saved. I write edgy romantic suspense (Walk the Right Road Series), western romance (Finding Love ~ The Outsider Series), and young adult mystery, and I warn my readers to expect the unexpected. I’m a mother of three children and we live on a small island in the Pacific Northwest. I encourage you to contact me by email; I do answer every email I receive. Stay tuned. There is more to come from the Walk the Right Road Series and Finding Love ~ The Outsider Series, as well as a brand new western romance series coming later this fall, The One. And to my readers and all of you who have shared my stories with your family and friends, a big, heartfelt thank-you.